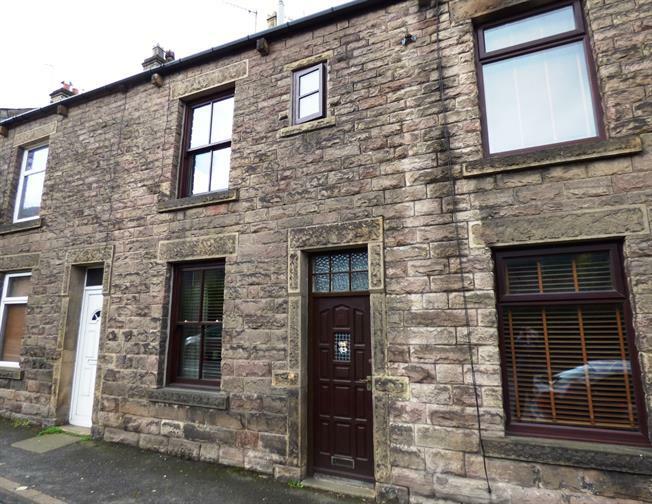 2 Bedroom Terraced House For Sale in High Peak for Guide Price £165,000. Ideally located in the centre of the village close to all public amenities, shops, restaurants and train station (Manchester - Buxton Line). Maintained and presented to a good standard throughout the layout in brief comprises a vestibule, lounge with a feature fire and a fitted dining kitchen. First floor landing, two bedrooms and a modern fitted four piece bathroom. A fixed staircase leads to the attic room currently used as a study/bedroom. Other features include hardwood double glazing, combi GCH and a rear garden backing onto the river Goyt. Glazed main entrance door. Courtesy light. Oak timber floor. Glazed internal bi-fold door. Hardwood double glazed sash style window to the front elevation. Double radiator. Oak timber floor. TV point. Gas coal effect living flame fire complete with a stone fire surround. Glazed internal feature bi-fold door opening into the kitchen diner. Hardwood double glazed sash style window to the rear elevation overlooking the river Goyt. Twin panel glazed rear door. Fitted matching range of wall, base and drawer units with granite work tops over. Staircase leading to the first floor accommodation. Double radiator. Vaillant combi gas central heating boiler. Ceramic tiled floor. Plumbing for an automatic washing machine and dishwasher. Space for an up right fridge freezer. Timber effect laminate floor. Doors leading off to all rooms. Hardwood double glazed sash style window to the rear elevation. Single radiator. Timber effect laminate floor. Fixed staircase leading to the attic room. Twin panel glazed internal feature door. Hardwood double glazed sash style window to the front elevation. Double radiator. Twin panel glazed internal feature door. Timber effect laminate floor. Built in airing cupboard. Hardwood double glazed window to the front elevation. Four piece matching polar white suite comprising a low level WC, panelled bath, wall mounted wash hand basin and a shower cubicle. Chrome effect fittings, attachments and heated towel rail. Slate effect tiled floor. Partially tiled walls. Double glazed Velux style window. Power and lighting. Carpet. Plaster boarded walls and vaulted ceiling. Single radiator. Currently used as a study/bedroom. Boundaries clearly distinguished by wood panelled fencing. Timber garden shed. Stone paved patio. Timber decking. Backing onto the river Goyt.